WOW, BEST RENDITION OF NATIONAL ANTHEM SINCE WHITNEY HOUSTON … THIS GAVE HE CHILLS!!! Major League Baseball may just become America’s favorite pastime again. In recent years the NFL passed baseball by as America’s favorite pastime; however, I feel the winds of change. With all the controversy going on in the NFL with entitled millionaire players disrespecting the national anthem, the American flag and the military by taking a knee, not standing, staying in the locker room or doing some other disrespectful gesture during the playing of our nation’s anthem, check out the video below and see how Major League Baseball got it right. Watch the players, Black, White, Asian and Hispanic, all standing with hats off with reverence and respect. Many of these baseball players are not even American citizens, but they show the respect for the anthem and flag. Then Keith Williams Jr., a black gospel sing, just nails it, NAILS IT and hits a grand slam! This rendition of the American National Anthem at the start of game one of the 2017 World Series between the LA Dodgers and the Houston Astros was simply amazing. That is how it is done NFL. But instead, the fools of the NFL continue to show disrespect and lose their fan base as more and more people tune off the NFL. Keep it up NFL. What is really sick, is we actually have people in this country who think it is appropriate to kneel. Shameful and indicative of a declining and respectful society. Thank you Keith Williams Jr!!! Hey, why not another version of the same rendition, this time with a fly over at the end. This is just fantastic. I cannot get enough of this video. What an amazing job at I time when we really needed it. KUDOS to MLB. Oh and by the way, it has been a great series!!! I am a lifetime Boston Red Sox fan and for most of my life the New York Yankees have been the bane of my existence, but it is with much love, respect and sorrow I say that Yogi Berra has passed away. Sadly, one of the greatest and most beloved New York Yankees of all times has passed away, Yogi Berra is dead at age of 90. His skill on the field as a catcher was certain and the man was a winner in all things on and off the baseball diamond. The man behind the mask and known to so many for his Yogisms will be sorely missed. He was born Lawrence Peter Berra was born on May 12, 1925, in the Italian enclave of St. Louis known as the Hill, and grew up to be one of the greatest, most unique and lovable Yankee icons of all time. Maybe greater than all his World Series wins, too numerous All-star appearances, 3 MVP’s, Yogi Berra served two-years in the U.S. Navy during World War II, serving as a gunner’s mate in the D-Day invasion, and had already played three seasons for the Yankees. Yogi is the last of the all time greats, they just don’t make them like this anymore. Yogi Berra, one of baseball’s greatest catchers and characters, who as a player was a mainstay of 10 Yankee championship teams and as a manager led both the Yankees and Mets to the World Series — but who may be more widely known as an ungainly but lovable cultural figure, inspiring a cartoon character and issuing a seemingly limitless supply of unwittingly witty epigrams known as Yogi-isms — died on Tuesday. He was 90. His death was reported by the Yankees and by the Yogi Berra Museum and Learning Center in Little Falls, N.J. Before moving to an assisted living facility in nearby West Caldwell, in 2012, Berra had lived for many years in neighboring Montclair. And so he was, and so he proved to be. 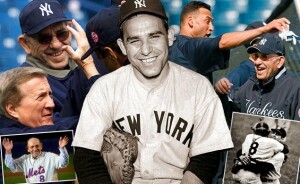 Universally known simply as Yogi, probably the second most recognizable nickname in sports — even Yogi was not the Babe — Berra was not exactly an unlikely hero, but he was often portrayed as one: an All-Star for 15 consecutive seasons whose skills were routinely underestimated; a well-built, appealingly open-faced man whose physical appearance was often belittled; and a prolific winner — not to mention a successful leader — whose intellect was a target of humor if not outright derision. Except for maybe Babe Ruth, Lou Gerig and Joe Dimaggio, Yogi may just be the greatest Yankee of all time and certainly belongs on the Mt. Rushmore of Yankee players. Beyond the historic moments and individual accomplishments, what most distinguished Berra’s career was how often he won. From 1946 to 1985, as a player, coach and manager, Berra appeared in a remarkable 21 World Series. Playing on powerful Yankee teams with teammates like Rizzuto and Joe DiMaggio early on and then Whitey Ford and Mickey Mantle, Berra starred on World Series winners in 1947, ’49, ’50, ’51, ’52, ’53, ’56 and ’58. He was a backup player on the championship teams of 1961 and ’62. (He also played on World Series losers in 1955, ’57, ’60 and ’63.) All told, his Yankee teams won the American League pennant 14 out of 17 years. He still holds Series records for games played, plate appearances, hits and doubles. No other player has been a champion so often. If you ever get a chance, go to the Yogi Berra Museum and Learning Center. Fantastic Obit at the NY Times. Forget about “Deflate-gate” or “Moneyball” welcome to HACK-BALL. The St. Louis cardinals find themselves in the cross-hairs of an FBI and Justice Department investigation into the allegations that they hacked into the databases of MLB’s Houston Astros. This makes Deflategate, Spygate, etc pale in comparison. Why? Because the Feds are involved. This is going to be very interesting as to where this leads. So far no one in the Cardinal organization has been suspended or fired. MLB needed a new scandal to deal with other than PED. Front-office personnel for the St. Louis Cardinals, one of the most successful teams in baseball over the past two decades, are under investigation by the F.B.I. and Justice Department prosecutors, accused of hacking into an internal network of the Houston Astros to steal closely guarded information about players. Investigators have uncovered evidence that Cardinals employees broke into a network of the Astros that housed special databases the team had built, law enforcement officials said. Internal discussions about trades, proprietary statistics and scouting reports were compromised, said the officials, who were not authorized to discuss a continuing investigation. Law enforcement officials believe the hacking was executed by vengeful front-office employees for the Cardinals hoping to wreak havoc on the work of Jeff Luhnow, the Astros’ general manager, who had been a successful and polarizing executive with the Cardinals until 2011. According to The Boston Herald, a woman who was hit by a broken bat during yesterday’s Boston Red Sox -Oakland A’s game is in serious condition with life-threatening injuries. The game was halted in the middle of the second inning following the incident. The woman, Tonya Carpenter, was rushed from Fenway Park is in serious condition to Beth Israel Deaconess Medical Center. Tonya Carpenter was sitting behind the visitors’ on-deck circle at Fenway Park Friday night watching the Red Sox take on the Oakland Athletics with a man and her son. Then, A’s third baseman Brett Lawrie shattered his bat on a groundout in the second inning, and the park went silent. The broken barrel of Lawrie’s maple bat had flown into the third-baseline stands and struck Carpenter in the head. Carpenter immediately began to bleed profusely, as medical personnel rushed to her aid. Carpenter was carted out of the park, her screams audible to fans, and transported to Beth Israel Deaconess Medical Center with what appeared to be “life-threatening” injuries, Boston police spokeswoman Rachel McGuire told Boston.com. Boston Globe: After injury, woman was wheeled away. At 7:45 a.m. Saturday, Beth Israel spokeswoman Jennifer Kritz said the hospital is not providing any information regarding the condition of the woman at this time. The team’s principal owner, John Henry, also owns the Globe. UPDATE I: Tonya Carpenter in Serious Condition But expected to Survive. A woman struck by a piece of a baseball bat at Boston’s Fenway Park suffered “life-threatening” injuries but is expected to survive, Boston police spokesperson Rachel McGuire said Saturday. The incident occurred during the second inning of Friday night’s Red Sox game against the Oakland Athletics when Athletics’ third baseman Brett Lawrie was at bat. The hospital identified the woman as Tonya Carpenter. She was in serious condition Saturday, according to hospital spokeswoman Kelly Lawman. The family was grateful for thoughts and prayers, the hospital said. IF A TREE FALLS IN THE WOODS MLB GAME IS PLAYED AND THERE IS NO ONE THERE TO WATCH IT, DOES IT MAKE A SOUND? TODAY’S SCORE FROM CAMDEN YARDS: BALTIMORE 0 – RIOTERS 15. STRIKE ONE … Thanks to the rioters, looters and those who cannot be trusted in Baltimore to protest calmly and without violence, the MLB game between the Chicago White Sox and the Baltimore Orioles will be played today, but there will be no fans in the stands. For the first time in the history of baseball, a game will be played with the public not allowed to be in the stadium to watch it. Way to go protesters you made history, you should be so incredibly proud of yourselves. The powers that be in baseball and the local authorities basically deemed that you could not be trusted to act accordingly. The game Wednesday will start at 2:05 p.m. ET. An MLB spokesman told ESPN’s Outside The Lines that the league is not aware of any other time that a major league game has been played, by design, without spectators allowed in to watch. In addition, MLB spokesman Matt Bourne said the league office would not comment as to how, if at all, it would compensate the Orioles for the lost attendance. STRIKE TWO: Major League Baseball and Barack Hussein Obama must have leaned nothing from GWB throwing out the first ball in Yankee Stadium following the terror attacks on 9-11. The decision to play today’s game at Camden Yards with no fans in the stands is BS. By doing so, you gave the violent looters and rioters their victory. If you could not protect the safety of fans in a ball park and their property, then maybe it would have been a better idea to postpones the game and play a double header at a later date in the season. Since you were willing to play a game with no fans, then you money grubbing SOB’s could have played a real double header, like in days or yore, to provide a gift to the Baltimore fans, rather than a day-night double header so you can double your profits. Hmm? Note to MLB, the optics look terrible of a game going on inside a locked stadium and fans on the outside looking in. If you were not going to make a statement and have GWB throw out the first pitch and say, “WE ARE BALTIMORE” … then cancel the game. Obviously, Obama was too much of a ninny to show up in Baltimore as the first black president would have been booed by folks that could have been his son as he has done nothing to help blacks during his presidency. In reality, it has been liberal Democrat policies that are responsible for inner cities like Baltimore and the lack of hope as all they have to look forward to is a welfare check and a hand out. STRIKE THREE: The City of Baltimore and liberal Democrat politics are the biggest losers and have struck out. Make no mistake about it, Baltimore, MD is not Ferguson, MO but yet the exact same thing occurred. The demographics of Baltimore is that it is 63% black and only about 31% white. The police make up in Baltimore is very diverse. However, the problem with Baltimore is the sad state of affairs of Democrat politics and the lack of hope that it provides to inner city minorities, who are in this case the majority. Baltimore County, much like the state of Maryland is a deep blue where is a Republican is ever elected it is by luck. But the problem and lack of opportunity, jobs and hope is a Democrat problem. It is the Democrat politicians that have left these folks behind where Barack Obama made comments as if he was not part of the problem. Keeping people dependent on the government generation after generation creates hopelessness and anger. It is only now that black America wants to take their wrath out on the police. But the Mayor and the police chief of Baltimore are black, so there goes that racial thing. The problem, as he explained it, is that Americans only worry about poor neighborhoods when there’s a crisis, failing to engage with their concerns and difficulties over time. “People have a tendency, once the fires have been put out, and the cars aren’t being tipped over, you know there’s not some immediate crisis, then folks wanna go back and focus on, you know, whatever reality TV thing is going on,” he said. Obama complained about “dis-invested” communities where the primary economy was the drug trade, where young people were more likely to go to prison than college. Who gave the stand down order to police that made them sitting ducks? Just curious, after watching the mob burn down business, loot and act in such a disgraceful manner, who in the hell would ever want to invest here? Making matters worse, to get back on track with the theme of this post, the protesters managed to create an atmosphere of uncertainty where MLB had to take action for the safety of its players and fans. Not only is today’s baseball game between the Orioles and Chi-sox without fans, it is without employing people of Baltimore selling beer, food, concessions and other memorabilia. It is without restaurants and bars in the downtown Camden Yard area making money from a day game. Do you know how much money the city of Baltimore has lost because these games now have to be moved and this one was played in front of no one? Way to go rioters, you showed them. Making matters worse for Baltimore and its people is the fact that the upcoming Oriole home-stand with the Rays is going to be played in Tampa Bay, Florida, not Baltimore. The hardworking folks who make a living from the playing of home baseball games are out of luck. Thanks rioters. Most importantly, a special thanks to the leftist mayor who obviously gave a stand down order to the police the day of the funeral of Freddie Gray. Oh yeah, remember him? Another blemish on Baltimore as the power structure, which is black, failed to put forth in a timely manner to diffuse the bomb before it blew. Baltimore exploded into riots and looked like Baltimore circa 1968, because of incompetence at the highest levels and an ideology to let protesters be protesters and let them get it out of their systems. What’s a couple, 2, 3, 20 businesses looted and burned. After all, in a PC society, we can’t make the rioters feel uncomfortable. In the end it is Baltimore and its power structure that has much to explain. From how does Freddie Gray die in police custody, to the lack of preparation to prevent riots to the business owners you turned your backs on.The plight of the poor is on you and the fact that you refuse to create an atmosphere to help break the cycle. Instead you just want to throw more failed money after more failed money. How’s that war on Poverty going? Obviously it has failed miserably.